It’s circus time again in Charlotte, NC at the Time Warner Cable Arena. 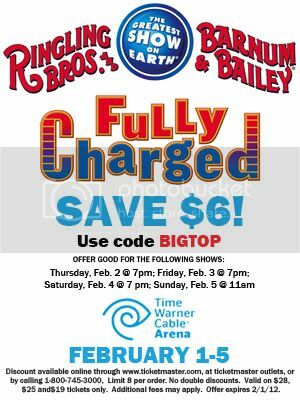 Ringling Brothers and Barnum & Bailey Fully Charged circus will have show dates of Feb. 1st – 5th, 2012 with 9 show times. Tickets are still available to purchase and don’t forget to use the special promo code: BIGTOP to receive your discount (see ad for more details). Also, one hour before show time, families can meet the performers, get autographs, and see an amazing elephant that paints at the All Access Pre-show –FREE with a purchased ticket! I am so excited to announce that we have a (4) pack ticket giveaway for a lucky family to attend the Ringling Brothers and Barnum & Bailey Circus Fully Charged performance on opening night – February 1, 2012 at 7pm. Don’t miss this opportunity to bring your family for some fun in Charlotte and enjoy this spectacular show. My favorite part of the circus is the elephants all dressed up oooand the clowns of course! We want to go to the circus! The USDA recently fined Ringling $270,000 for 24 violations of the Animal Welfare Act. http://www.aphis.usda.gov/animal_welfare/downloads/FEI_signed_agreement.pdf. If Ringling puts on The Greatest Show on Earth then there is no reason why they can’t continue on with just their Human Performers. My kids love the whole show, but their favorite part is the motorcycle show! We all love animals but my kids haven’t yet been to the circus yet. We love going to the circus. We took our daughter for the first time last year and she loved it. We got there early so she could go and see the performers and watch the elephant paint, it was wonderful! would love to take my son for the first time.